How often have you picked up one of those really classy international magazines and skimmed through the beauty column to look for something that could probably nourish both your skin and hair? Only to be disappointed with the list of treatments mentioned not being available at most salons near you. 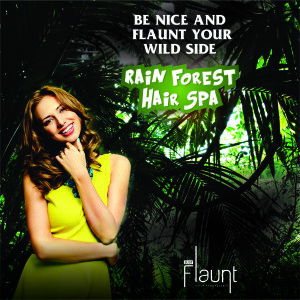 Just Flaunt Salon presents a unique hair spa called Rain Forest Hair Spa. Specially designed to rejuvenate Dry Hair, Coloured Hair or Chemically Treated Hair. It’s a hair therapy that will add long-lasting healthy shine to your hair. It’s highly recommended you take a hair spa in regular intervals to maintain your hair. As regular Rain Forest Hair Spa would do a lot more good than you can possibly imagine. A simple process once a month would go a long way in saving you from future problems like hair fall and dryness. This therapy brings back an extra shot of moisture to your hair. This exotic treatment is a combination of natural ingredients gathered from the dense forests of Africa, to help exfoliate dead substances and give your scalp space to breathe and grow. Rain Forest Hair Spa helps you nourish your hair for a shine that’s healthy and long lasting. The entire treatment is designed to help you destress and pamper yourself. We all would love to maintain our hair as far as possible. But a busy schedule, long working hours and dreadful pollution do not make a great combo. And this combo leads to lifeless hair with no shine. To add to this, we’ve also got hard water issues across the city. And We have designed this Rain Forest Hair Spa to add life to your hair. So ladies, do not miss out on this amazing Rain Forest Hair Spa. It’s exotic. And it’s brought to you by Just Flaunt Salon.